Kuala Lumpur, 5 September 2014 The INOV-8 Pacesetters 3030 Run 2014 was officially launched today at the Garden Mid-Valley Mall, Kuala Lumpur. 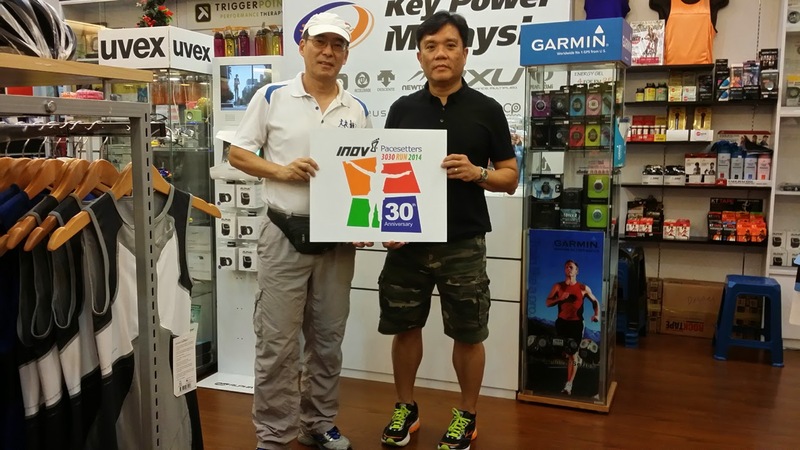 Organised by Pacesetters Athletic Club (PAC) with title sponsor INOV-8, the event was officiated by Mr. Robert Lu, the President of Key Power International and Mr. Wan Yew Leong, the President of Pacesetters Athletic Club. With all 8 categories opened for registration since 16 July 2014, the event has garnered good response from runners. The organisers targeted to get 3,000 runners over the 3 distances - 30km, 20km and 10km. INOV-8 Pacesetters 3030 Run 2014 is to be flagged off at Padang Merbok. Runners will get to experience some of the finest run routes in Kuala Lumpur, running through leafy Kenny Hills and Sri Hartamas. They will be well catered to, with 13, 8 and 3 drink stations on the 30km, 20km and 10km routes respectively. “As a running club, we encourage our members to go natural in their diet as we feel the best fuel the body can get is from natural sources, therefore we aim offer fruit-themed refreshments. We will serve bananas before, during and after the run. In addition, water melons, oranges & apples will also be provided as post run snacks” Wan added. “Our club’s tagline, ‘Setting the Pace Together’ will be printed on the finisher’s shirts. The INOV-8 Pacesetters 3030 Run originated from a 30km training run organized by runners for runners many years ago. We hope this event will inspire other running clubs in the country to have their own events in their towns. We have a vision of a circuit of runs organized by runners for runners across the country. PAC will provide the lead in co-ordinating a series of runs by running clubs in 2015.” concluded Wan. Robert Lu said “The Ministry of Youth and Sports’ vision is to champion the empowerment of superior youth and sports development and to inculcate sports culture within the society by year 2015. Our focus includes exposure and opportunities for confidence building, engagement and activism for community development and to support and engage the youth of Malaysia." This is our sixth 30km event and it is made possible by title sponsor INOV-8 in partnership with event owner and organiser, Pacesetters Athletic Club. Garmin is the official fitness watch and Running Malaysia is the media partner of the event." The INOV-8 Pacesetters 3030 Run 2014 is scheduled to take place on 2 November 2014. The event aims to get 3,000 runners, ranging from elite professionals to first-time amateurs. A truly ‘best in class’ event, the INOV-8 Pacesetters 3030 Run 2014 boasts participants from all over Malaysia and neighboring countries. The INOV-8 Pacesetters 3030 Run 2014 continues as Malaysia’s boutique running event catering to the running fraternity with different capabilities. Established in 2003, Inov-8 is the leading fitness equipment manufacturer with the dedication to celebrate the grit and glory of the committed athlete. Inov-8 operates at the extremes of sports. As a brand, Inov-8 does not settle or stop ever. In the pursuit of excellence, there is no finish line, only continued development, hard work and sweat. Driven by a team of elite athletes, having competed in and coming from various disciplines all over the world, which includes mountain running, road running, triathlon and Cross Fit, Inov-8 is bent on providing the best fitness equipment. Founded in 2006 by avid runners and triathletes, Key Power is the leading distributor and retailer for performance sporting goods. With a deep focus and understanding on the needs of the markets, Key Power International has delivered the promise in providing the best performance gears. Today, through Key Power International’s extensive distribution network and a footprint in 4 key regional markets, namely Singapore, Malaysia, Indonesia and Brunei, Key Power International has provided the experience and opportunities to consumers in their pursuit of active lifestyles. Key Power Malaysia is the subsidiary company of Key Power International (Asia) Pte Ltd. Founded in July 2011, Key Power Malaysia has been active in the sporting industry with a focus on providing the best performance sporting goods for consumers. With 3 key outlets in Malaysia and many other exclusive dealers, Key Power Malaysia has achieved a strong presence in Malaysia’s sporting industry. Apart from that, Key Power Malaysia has also participated actively in sporting events to bring forth opportunities for consumers to pursue active lifestyles.